“What Mrs. Dorr's permanent place in the history of American literature may be is not to be discussed at a time like the present. If it depends upon the beauty and merit of her work and its appeal to human sympathies, it will be a large one”. Though not born on Vermont soil, (Charleston, South Carolina merits that distinction), Julia Dorr spent her creative years under the beneficent influence of its beauties and traditions. Motherless at eighteen months, the future authoress was cared for by a Mrs. Hastings Warren of Middlebury during the ensuing two years until her father, having moved his business to New York City, sent for her. Two years later, in 1830, he returned to his native state, bought a farm near Middlebury village, and married Jane Warren of that town. Julia's early education was a mixture of parental tutelage and boarding schools. She spent many hours in her father's well-stocked library, writing poetry (which she hid in sundry places to avoid detection). 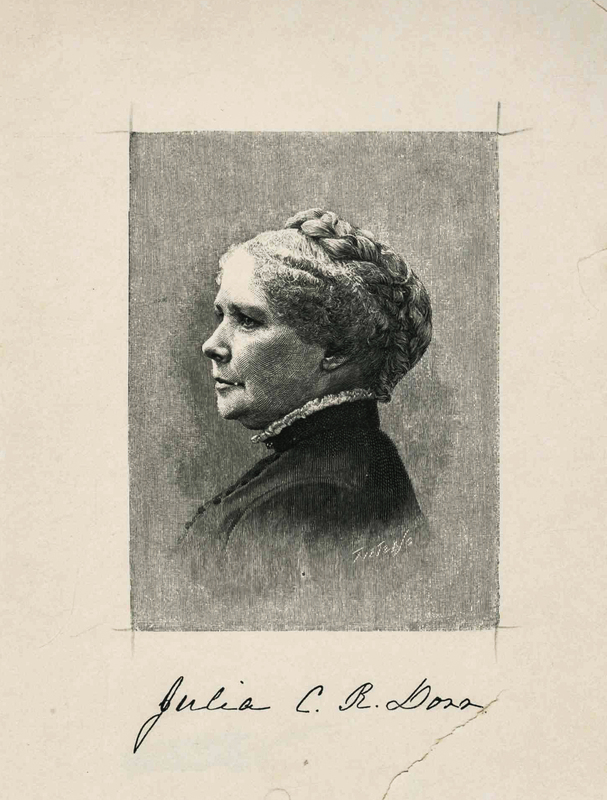 At 22 she married Seneca M. Dorr, who later became a well-known political figure, first as representative of Rutland in the legislature, and later as Senator from Rutland County. 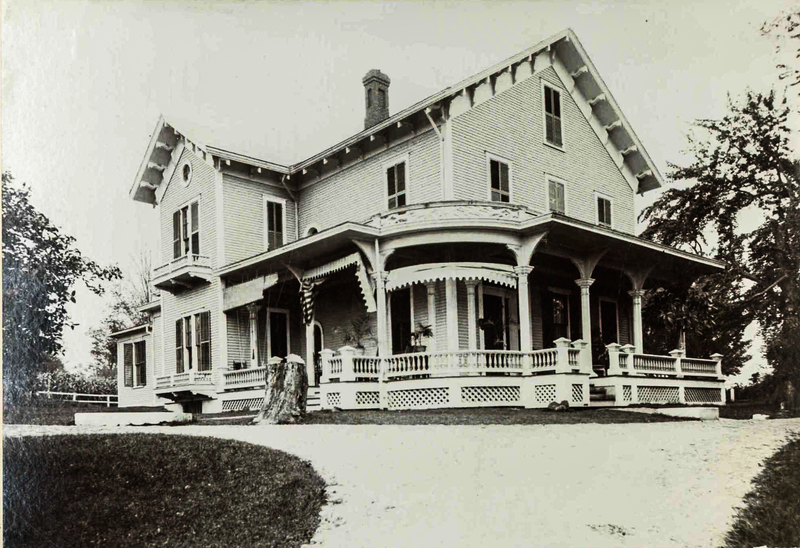 Originally intending to "stop-over" in Rutland on the way westward, they decided to remain, and built "The Maples," Julia Dorr's home until she died. It was there that her public literary career began. Accounts differ as to the exact details which lead to her appearance in print for the first time. What is certain was that at 24 one of her poems was accepted by The Union Magazine, for which she was paid the sum of $5. Her first real recognition came, however, when a story she submitted in competition was published. (Edward Everett Hale and James Russell Lowell were also among the ten prize winners). Though hailed as a promising novelist, (for Farmingdale, Sybil Huntington and Expiation). Mrs. Dorr's fame seems to rest as a poet. Later, after her husband's death, she travelled extensively, and penned such well-known travelogues as Flowers of England's Face and A Cathedral Pilgrimage. 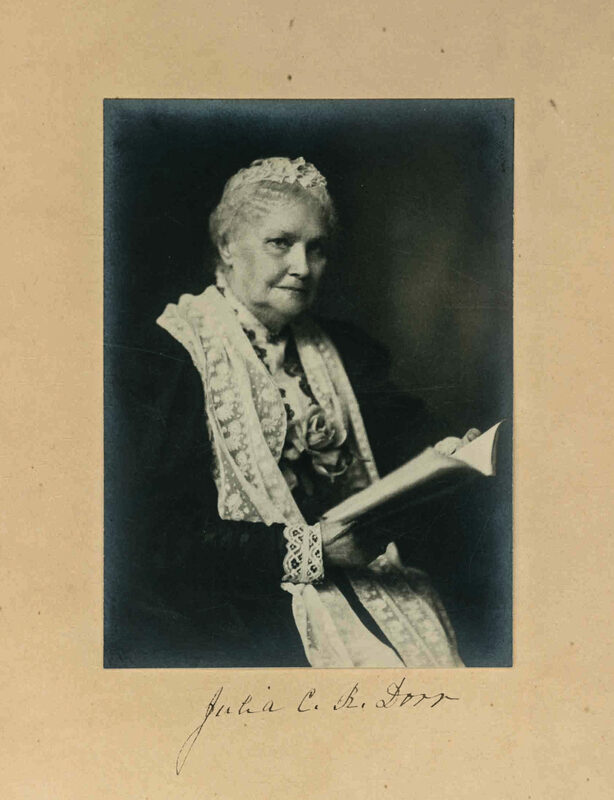 Recognition and lifetime friendships came her way as witnessed by praise and correspondence with such noted literary figures asRalph Waldo Emerson, William Cullen Bryant, Henry Wadsworth Longfellow, William Dean Howells, and another Vermont writer, Rowland E. Robinson. (For an account of her friendship with the latter see Paul Eschholtz' article in this issue). Julia Dorr seems to have been one of those rare individuals who caught and held the Muse during the span of her career. In 1900, at the age of seventy-five, she published Afterglow, a collection of her poetry, followed in 1909 by Beyond the Sunset. In the summer of 1912, only a few days before her final illness began, she finished a sonnet, a charge to youth. It is with pleasure that we bring to our readers this tribute to one of Rutland's foremost citizens. "The Fallow Field"- is a collection of poems by Julia C. R. Dorr. The work was published posthumously in 1893 by Lee and Shepard Publishers of Boston. This work is most notable for its beautiful charcoal illustrations that were done by her daughter Zulma De Lacy Steele.